Every year a special Mass for the departed is said in each church and, after Mass, the priest blesses the graves. For this occasion parishioners make a special effort to attend to their family plots and array them with flowers. The graveyard committees, too, ensure that the grass, paths, and borders are looking their best. 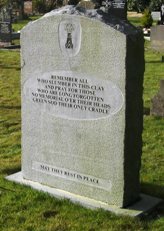 In 2010, the graveyard Mass was said in the Church of the Immaculate Conception, Fenor, on Thursday August 5th, and in the Sacred Heart Church, Dunhill, on Tuesday August 10th. As the graves were looking particularly well, we took quite a few photos and have presented them in two albums for you to look at. We couldn’t show all the graves as there are too many so we simply showed a selection. You can see the photographs by going to the Parish Photo Albums. At the Fenor Mass Fr. Paul Murphy, the then parish administrator, presented Fr. 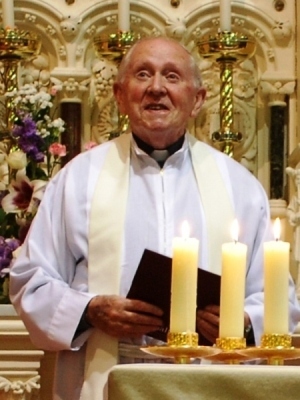 Gerard Purcell with a token of our esteem and gratitude on the occasion of his 60th year as a priest, many of those years having been spent as our parish priest. 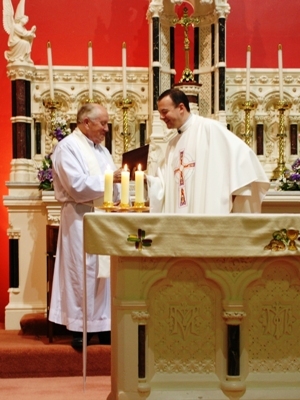 The two photographs below were taken during the Mass (thanks to Geraldine Middleton).